DUE TO THIS CONVERSION, ONLINE TAG RENEWALS WILL BE UNAVAILABLE DURING THIS TIME. PLEASE MAKE ARRANGEMENTS TO RENEW YOUR TAG EARLY IF YOUR BIRTHDAY FALLS IN THIS TIME FRAME. THANK YOU FOR YOUR UNDERSTANDING THAT THIS A STATEWIDE CONVERSION OF OUR COMPUTER SYSTEM. Tags must be renewed on or before your birthday. Property taxes are due by December 1 each year. Mobile home taxes are due by April 1 each year. Personal property forms are due by April 1 each year. Please note: If you no longer own the listed items, you must contact the Assessor's Office or you will be taxed on it. All mobile homes must be registered in the Assessor's Office. You must display your decal. If you do not do so, you can be summoned to Magistrate Court for failure to display. Property - Interest will be added to your tax bill on the second (2nd) of each month. In April of each year, a 10% penalty is added and will be subject to a lien and additional collection procedures. Real property sold have one year right of redemption. Mobile Homes - A 10% penalty is added to your tax bill after May 1. If you trade in a vehicle, keep your old tag. As long as the tag and the vehicle are in the same name we can transfer that tag to your new vehicle. All vehicles from 1986 or newer require a Georgia title in order to register it. The State of Georgia offers a variety of tags. If you purchased a vehicle out of state, you may be liable to pay sales tax to Georgia before we can apply for your title and issue a tag. If you cancel your insurance for any reason, please contact our office at (706) 517-1400 ext. 1 to cancel your registration. If you do not do this, you will receive a letter from the state with a $25 lapse fee. If you fail to comply and pay that fee you will get an additional fine of $65. To cancel your registration, come to our office, located at 121 North Fourth Avenue, and show a form of ID. Ad valorem tax, more commonly known as property tax, is a large source of revenue for local governments in Georgia. The basis for ad valorem taxation is the fair market value of the property, which is established as of January 1 of each year. The tax is levied on the assessed value of the property which, by law, is established at 40% of the fair market value unless otherwise specified by law through the Official Code of Georgia (O.C.G.A. 48-5-7). Fair market value, means “the amount a knowledgeable buyer would pay for the property and a willing seller would accept for the property at an arm’s length, bona fide sale.” (O.C.G.A. 48-5-311) The amount of tax is determined by the tax rate (mill rate) levied by various entities (one mill is equal to $1.00 for each $1,000 of assessed value, or .001). The State Revenue Commissioner is responsible for examining the tax digests of counties in Georgia in order to determine that property is assessed uniformly and equally between and within the counties (O.C.G.A. 48-5-340). In addition, the State levies ad valorem tax each year in an amount which cannot exceed one-fourth of one mill(.00025). 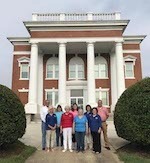 The County Board of Tax Assessors, appointed for fixed terms by the county commissioners, is responsible for the appraisal, assessment, and the equalization of all assessments within the county. They notify taxpayers when changes are made to the value of property, receive and review all appeals filed, and insure that the appeal process proceeds properly. In addition, they approve all exemptions claimed by the taxpayer. The County Board of Equalization, appointed by the Grand Jury, is the body charged by law with hearing and adjudicating administrative appeals to property values and assessments made by the Board of Tax Assessors. The Board of County Commissioners, an elected body, establishes the annual budget for county government operations and levies the mill rate necessary to fund the portion of the budget to be paid for by ad valorem tax. The County Board of Education, an elected body, establishes the annual budget for school purposes and adopts the mill rate necessary to fund the portion of the budget to be paid for by ad valorem tax. The County Tax Commissioner, an elected office established by the Constitution, is the official responsible for performing all functions related to billing, collecting, accounting for and disbursing ad valorem taxes collected in this county. The Tax Commissioner also serves as an agent of the State Revenue Commissioner for the registration of motor vehicles. To obtain a Disabled Persons Parking Placard, obtain a Disabled Persons License Plate Affidavit (MV-9D form) and take it to a licensed practitioner for completion. The completed notarized form must then be returned to the tag office to receive your placard. Murray County businesses may also apply for a Disabled Persons Parking Placard by submitting a copy of the company's Institutional License and a completed MV-9D form stating that the vehicle is exclusively used in the transport of disabled persons. Taxes on motor vehicles are due on the owner's birthday. Vehicles owned by a business pay tax based on the first letter of the Business name. The tax is based 40% value of the vehicle. Taxes are due on a vehicle, even when it is not in use. Proof of insurance on vehicle: Georgia liability insurance is required to be transmitted to the state’s database by your insurance company in order to register your vehicle. The vehicle must be covered by liability insurance at all times or a lapse in coverage penalty will apply. If you cancel the insurance, you must also cancel the registration. View insurance requirements for additional information. Newly purchased vehicles must be registered within 30 days. If you sell a vehicle, you keep your tag. Tags can be transferred to new vehicles that are registered to the same first owner. Proof of title (bill of sale for 1985 and older) is required to purchase a tag or transfer a tag from a vehicle you no longer own. Beginning January 1, 2006, Georgia state sales tax must be paid on all vehicles purchased outside the State of Georgia prior to registration of the vehicle. Business / Enterprise Registrations - Registrations in the name of a business, corporation, or organization are due at the end of the business owner's designated registration month. Business registrations are determined by month according to the first letter of the company name as shown on the registration application. Insurance Requirements - Find out what qualifies as proof of insurance with our office. Leased Vehicles - You must register during the 30-day period ending on the lessee's birthday, no more than 30 days prior to the lessee's birthday, and no later than the close of business on the lessee's birthday. Name Changes - If you wish to have your name changed on your registration due to marriage or divorce, you must first apply for a new title. A name change requires that you appear in person with your original certificate of title and supporting certified legal documents (i.e., certified copy of the marriage certificate, divorce decree, etc.). In the case of divorce, the divorce decree must give the year and make of the vehicle. If a vehicle is financed, only the security lien holder can change the name on the title. Tags expire and taxes are due on the birthday of the first owner shown. Renewals must be made on or before the birth date of the primary owner when owned by an individual, or the last day of the month for a business. You should receive a bill 30 days prior to renewal. Failure to receive a bill in the mail does not relieve the penalty. If you do not receive a bill, call the Tag Office at (706) 517-1400 with your tag number and one will be mailed to you. If you wish to have your name changed on your registration due to marriage or divorce, you must first apply for a new title. A name change requires that you appear in person with your original certificate of title and supporting certified legal documents (i.e., certified copy of the marriage certificate, divorce decree, or other similar legal documents). In the case of divorce, the divorce decree must give the year and make of the vehicle. If a vehicle is financed, only the security lien holder can change the name on the title. Registrations in the name of a business, corporation, or organization are due at the end of the business owner's designated registration month. Business registrations are determined by month according to the first letter of the company name as shown on the registration application. You must register during the 30-day period ending on the lessee's birthday, no more than 30 days prior to the lessee's birthday, and no later than the close of business on the lessee's birthday. For additional information concerning tag renewals, please contact the tag office at (706) 517-1400 option 1. Do I pay taxes on my mobile / manufactured home? This is an abbreviated list - please see the Official Code of Georgia for a complete list (O.C.G.A. 48-5-220).